LAS VEGAS – In addition to the recently announced lightweight battle between Ricardo “Dinamita” Alvarez (23-2-3, 13 KOs), older brother of Canelo and hard-hitting Sergio “Yeyo” Thompson (28-3, 26 KOs), of Cancun, Mexico, the March 8 undercard for “TOE TO TOE: Canelo vs. Angulo” will feature five more can’t-miss bouts for those in attendance at the MGM Grand Garden Arena in Las Vegas. In a junior lightweight fight scheduled for 10 rounds, unbeaten Australian star “Wild” Will Tomlinson makes his United States debut against Texas’ Jerry “The Corpus Christi Kid” Belmontes. Plus, two more rising stars from the 130-pound weight class face off when Mexico City’s Francisco “El Bandido” Vargas battles Puerto Rico’s Abner Cotto. 2012 U.S. Olympian Joseph “Jo-Jo” Diaz Jr. takes on Jovany “El Cepillo” Fuentes in an eight-round super bantamweight bout preceded by a six-round junior welterweight bout starring unbeaten Keandre Gibson against Antonio “Tony” Wong. In the opening match on March 8, Australian prospect Steve Lovett faces an opponent to be announced in a six-round light heavyweight contest. In addition to the exciting main event on “TOE TO TOE: Canelo vs Angulo,” there are three more fights on the SHOWTIME Pay-Per-View portion of the card: undefeated two-division world champion Leo “Terremoto” Santa Cruz (26-0-1, 15 KOs) will defend his WBC Super Bantamweight World Title against former three-time world champion Cristian “El Diamante” Mijares (48-7-2, 22 KOs); “King” Carlos Molina (22-5-2, 6 KOs) will risk his IBF Junior Middleweight Championship against undefeated Jermall Charlo (17-0, 13 KOs) and former two-time World Champion Jorge “Niño de Oro” Linares (35-3, 23 KOs) will take on exciting Japanese contender Nihito Arakawa (24-3-1, 16 KOs). A native of Sydney, “Wild” Will Tomlinson (21-0-1, 12 KOs) was an amateur standout who competed in the 2007 World Championships before becoming a professional boxer in July 2008. Winner of several pro titles, including the Australian, New South Wales State, WBO Asia Pacific, WBO Oriental and IBO Inter-Continental belts, the 27-year-old won the vacant IBO super featherweight crown in November 2011 by defeating Alan Herrera. Tomlinson has successfully defended his title three times, most recently against Malcolm Klassen on May 16, 2013. On a quest to get back to his winning ways after tough decision losses to fellow prospects Francisco Vargas and Andrew Cancio, Jerry “The Corpus Christi Kid” Belmontes (18-3, 5 KOs) has everything to gain this Saturday when he tackles Tomlinson. The exciting 25-year-old up-and-comer hopes he can get his year off to a rousing start with a victory in his first Las Vegas appearance since 2008. A representative of the 2008 Mexican Olympic team, Francisco “El Bandido” Vargas (18-0-1, 13 KOs) stepped up in a big way in 2013, scoring victories over Ira Terry, Cristian Arrazola, Brandon Bennett and Jerry Belmontes that proved that he was ready to make his push for a world title in 2014. That push begins on March 8 against Abner Cotto. Owner of 235 wins as an amateur, Caguas, Puerto Rico’s Abner Cotto (17-1, 8 KOs) has done the family name proud ever since he put the gloves on. The cousin of Miguel and Jose Cotto, 26-year-old Abner has won all but one of his professional bouts, most recently stopping Daniel Ruiz in four rounds in September 2013. On Saturday, it’s a pivotal meeting against Francisco “El Bandido” Vargas. Joseph “Jo-Jo” Diaz Jr. (9-1, 6 KOs), of South El Monte, Calif., continues to impress with each victory and despite being a pro for less than a year, the 2012 U.S. Olympic boxing team member has shown poise way beyond his years. Fresh off a seventh-round technical knockout over Carlos Rodriguez last December, the 21-year-old will look to show the continuing evolution of his fight game against Bayamon, Puerto Rico’s Jovany Fuentes (5-3, 4 KOs), a potent puncher who has won three of his last five bouts. St. Louis’ Keandre Gibson (8-0-1, 3 KOs) will look for his ninth win as a pro against Tijuana, Mexico’s Antonio “Tony” Wong (12-6-1, 7 KOs). A 2006 National Golden Gloves champion and Junior Olympics Bronze medalist, the 23-year-old Gibson is seen as having world championship potential, but he will be put to the test by Wong. In the opening bout of the card, 28-year-old New South Wales native, undefeated Steve Lovett (7-0, 5 KOs) puts his unblemished record on the line as he makes his United States debut against an opponent to be announced. “TOE TO TOE: Canelo vs. Angulo,” a 12-round super welterweight fight taking place Saturday, March 8 at the MGM Grand Garden Arena in Las Vegas, is promoted by Golden Boy Promotions and Canelo Promotions and sponsored by Corona, AT&T and Casamigos Tequila. In world title fights on the undercard, two-division World Champion Leo Santa Cruz will defend his WBC Super Bantamweight World title against former three-time World Champion Cristian Mijares and Carlos Molina will defend his IBF Junior Middleweight Championship against undefeated Jermall Charlo. Carlos Molina vs. Jermall Charlo is presented by Golden Boy Promotions in association with Warriors Boxing. The four-fight telecast, which opens with a 10-round lightweight bout between Jorge Linares and Nihito Arakawa, will be produced and distributed live by SHOWTIME PPV beginning at 9 p.m. ET/6 p.m. PT. The event can be heard in Spanish using secondary audio programming (SAP). 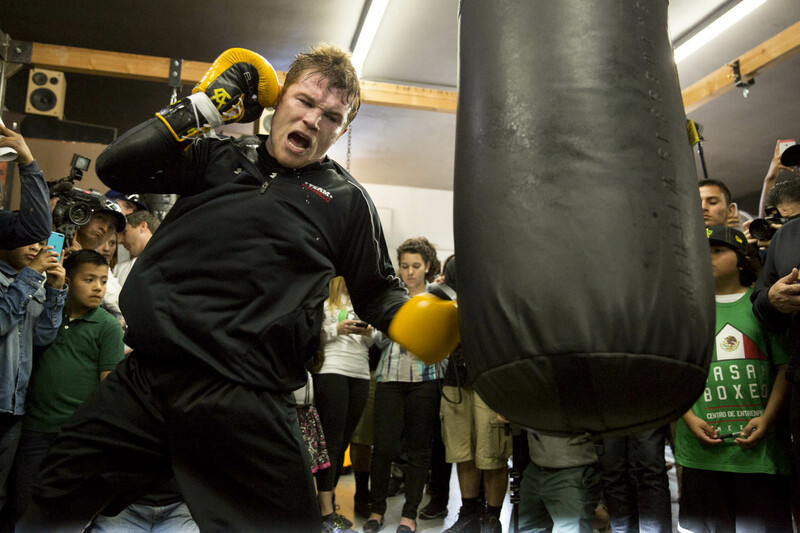 “TOE TO TOE: Canelo vs. Angulo” will be broadcast on over 400 select movie theaters across the country. @MGMGrand, @SHOSports and @Swanson_Comm follow the conversation using #CaneloAngulo and become a Facebook fan at www.facebook.com/GoldenBoyBoxing and www.facebook.com/SHOBoxing.